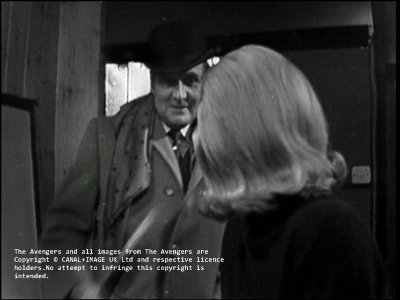 Tangling with the minions of a diabolical mastermind, a Cybernaut or a fight against a foreign agent can easily result not only in destroyed bowler hats but also in damaged clothing. 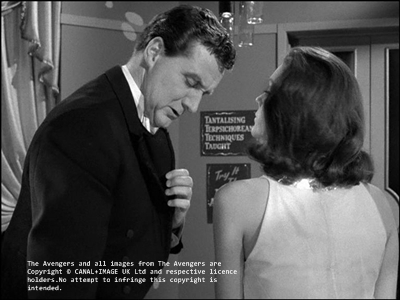 There's a damaged deposit at Steed's tuxedo in Quick, Quick Slow Death, but Mrs. Peel shows some unexpected skills and is sewing the damage afterward. Steed is attacked not only by humans but also by animals. 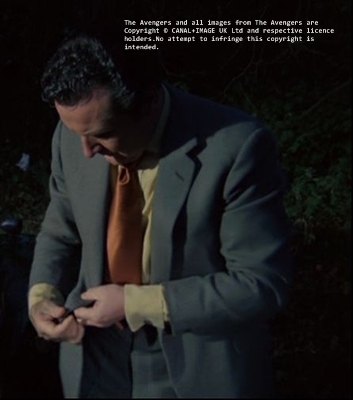 Such an event results in torn cuffs in Warlock after the German Shepherd attacked Steed. But as an Englishman Steed is a dog lover. He does not kill the animal, but only stuns it with chloroform. Normally Steed's clothing is in pristine condition, but there's a dirty spot on Steed's back in The Morning After. It looks like break fluid or oil. Some of his enemies take "souvenirs." 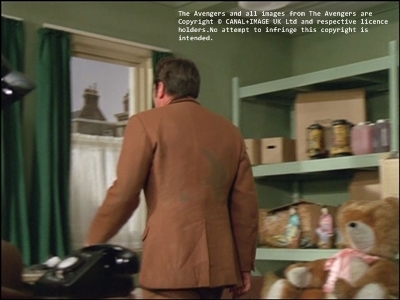 In The Curious Case of the Countless Clues, they rip off a button from Steed's suit jacket ( and stole his bowler). 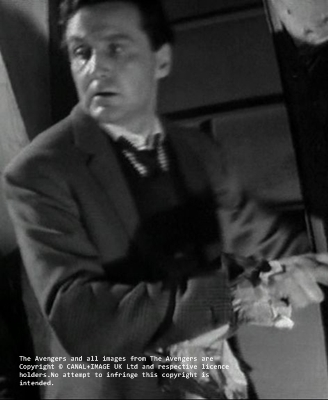 There is no damage, but Steed's scarf is not properly fixed in the episode Mandrake. - Wet and dirty shirt after crawling through the sewer in The Wringer. - Dirty suit and bowler from crawling through the ventilation shaft in The Cybernauts. - Dirty Tuxedo after the fight in the garage in Dial a Deadly Number.